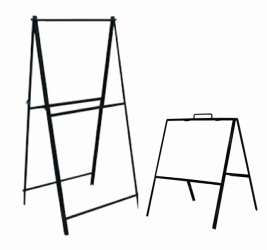 Economical way to display your messages from both sides with this black powder coated metal "A" frame. Can be used for indoor or outdoor displays. Includes a locking mechanism that prevents frame from opening flat, but which allows to close the frame flat for easy storage or transport.